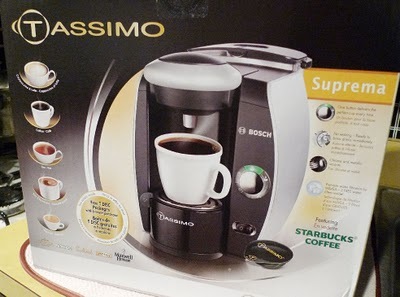 The PR folks at Tassimo sent over a complimentary Tassimo Suprema, super excited! I’m a typical single person in a typical studio apartment so any new appliance/product that makes my life easier, I’m all for it. 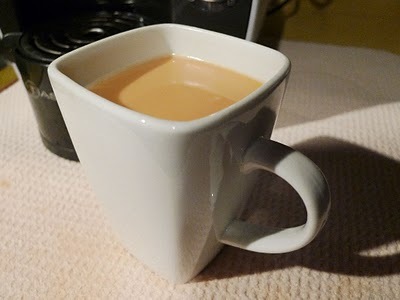 I like waking up to coffee/tea but milk never seems to last in my fridge plus anything that takes more than 10 minutes to make it’s too complicated in my opinion, so I’ve settled for plain tea or instant coffee over the years. Secretly I’ve wished coffee shops delivered, but that’s just me and my laziness. 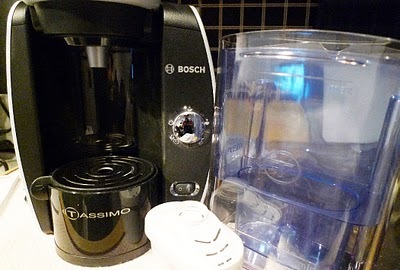 Now that I’ve welcomed Tassimo Suprema into my life, voila, a personal barista in my tiny little so called kitchen and hello yummy drinks in minutes! The machine comes with it’s own water filtration system. 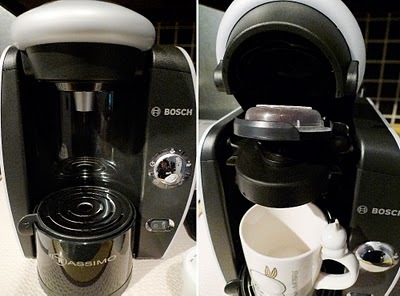 It’s as easy as adding water and pressing start button after the initial cleaning. 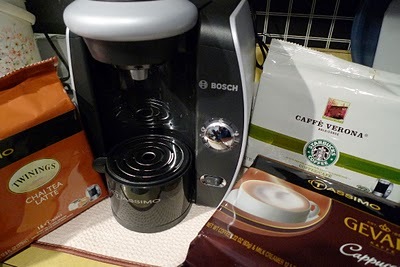 Along with the machine, they sent over Starbucks coffee, Gevalia Cappuccino and Twinings Chai Latte. 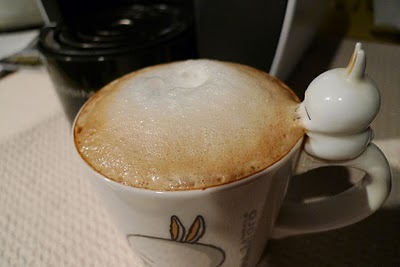 I love cappuccinos and lattes, I couldn’t wait! 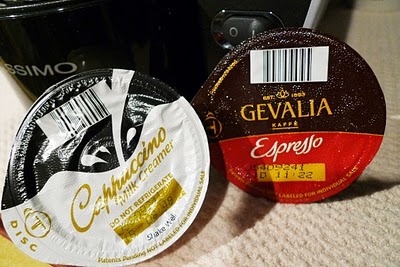 I didn’t know the expresso and milk came separately, very amused and intrigued about it… They call these T DISCs. I’m a fan of latte anything, so this was right up my alley. Again, tea and milk come in separate T Discs. 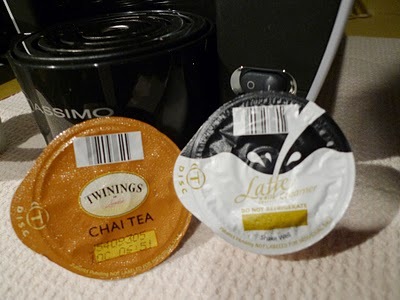 Same idea as the cappuccino, place tea T Disc first – press button, change to milk T Disc and let it run, 2-3 minutes later, a steamy hot cup of Chai Latte awaits. 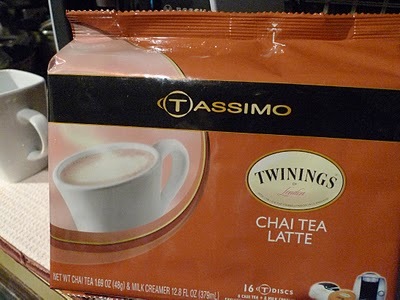 It’s sweetened, the milk is creamy and the tea so aromatic. I just like to come home, kick back and relax while I turn on the “tele”(add British accent here). It’s become my nightly pre-bed routine. 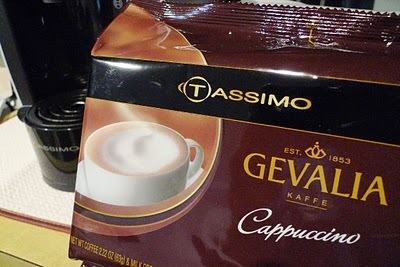 I’m seriously addicted, drinking Cappuccino as we speak or write/read in this case. I’ve been having at least a cup of something everyday (it’s been a week). Will stock up on lattes and cappuccinos this week. Honestly, it’s so worth it. Cheaper and faster than your Starbucks run and you can’t get lattes at 4 a.m or whenever you fancy. They have different types/brands of coffees, teas and hot chocolates. Can't believe you got an espresso maker!!! That's awesome! Are you limited to using proprietary cups that they provide? Or can you make your own if, for example, there's a particular brand of coffee that you like? We have an automatic espresso maker at home which we love because you can pick your beans (it grinds it for you), and it's still just as convenient, although the machine might be more expensive than a Tassimo! I know right? i was so excited!! !